PLO Executive Committee Member Dr. Hanan Ashrawi received Commissioner-General of the United Nations Relief and Works Agency for Palestine Refugees (UNRWA) Pierre Krähenbühl who was accompanied by his Chief of Staff Hakam Shahwan at the PLO Headquarters in Ramallah. Dr. Ashrawi thanked UNRWA for its dedicated and professional efforts in providing the 5.3 million Palestinian refugees in Occupied Palestine, Jordan, Lebanon, and Syria with essential services, assistance and opportunities for work, growth and development while safeguarding their legal and political rights. She also lauded their overall contribution to the stability of the region as a whole. The discussion focused on the enormous challenges and financial shortfalls facing UNRWA in carrying out its mandate to assist the Palestinian refugees as a result of the US administration’s politicization of humanitarian aid by defunding UNRWA. “It is unfortunate that the US administration decided to use UNRWA as a political tool in its efforts to pressure and blackmail the Palestinian people and leadership, thereby causing harm to the most vulnerable segment of the Palestinian population. In its overzealous drive to serve Israeli interests and priorities, the US is also targeting international organizations and the global rule of law in order to unilaterally reshape them. These attempts will only fail and will isolate the US government in the international arena and undermine its global influence and standing. 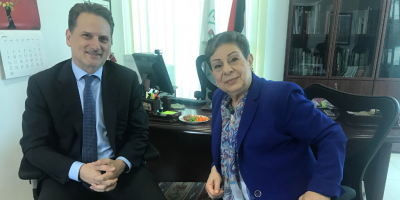 Dr. Ashrawi also appealed to the entire international community to provide UNRWA and the Palestinian people with a safety net and financial stability. In addition, both parties affirmed continued PLO-UNRWA coordination and cooperation and enhanced consultations on issues of mutual interest. Featured image is from PLO.